Fall leaves toppled from the trees, pets of all sizes and colours flitted and floated around, chattering wildly. Ideas were thrown around of different things to be, arguments over two pets with the same costume, and then, of course, the looming prospect of all the candy. 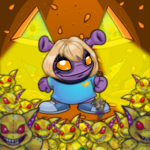 One thing was for sure- that Halloween had descended upon Neopia, and there wasn't a pet in the land who wasn't wiggling with joy. Lex the yellow Acara nearly leapt from her skin with happiness as she walked with her siblings toward their quaint little Neopia Central home. "Tonight, I'm gonna be... Ylana Skyfire!" she cheered, her little pink paw pumping happily into the air. Her brother Colfer rolled his eyes at his sister's outburst. "I'm going to be a little more distinguished, Lex. I'm going to be dressed up like a scientist," the red Gelert added; he couldn't help but smile. "I have a lab coat and everything. It's going to be fantastic." Lex stuck her tongue out at him and he reached to slap her, when Garo stepped forward, shaking her head. The pink Lutari was the foster pet of the family and while she technically wasn't their real sister, she did what she could to stop the two most dysfunctional pets in the family from arguing. "I'm just gonna be a ghost," Garo said, hoping to steer the conversation a little farther away from some kind of all-out brawl between Lex and Colfer. The pets nodded. Of course, a ghost was a perfectly respectable costume for a day as spooky as this one. And then, of course, Wesson, the proverbial runt of the litter, came bounding up next to them, grinning as his Island wreath banged against his chest. "I'm going to be the Extreme Potato Counter!" the Kougra announced. "And Weslie will be my potato!" The Altachuck gripped in his tiny paws let out a chirping noise and the other pets couldn't help but giggle at his spud-based enthusiasm. Leave it to Wesson to have the most creative costume of the group. They rounded the corner, mounted the steps to the front door, waved idly at their owner who was busily preparing the candy, and slipped into their respective rooms to prepare for the night's events. It would, of course, take a few hours if they wanted to look absolutely perfect. And who wouldn't? A night on the town, displayed proudly for Neopia. It was just too good to pass up. Lex donned a little blue fur tint and some armour, Colfer his new white lab coat with glasses, Wesson in his overalls was hastily wrapping some brown fabric around his little Weslie, and of course, Garo with a simple white sheet. She stretched, her costume clearly the easiest, and looked at her daily agenda. Running a pink finger down it, she gasped, having forgotten the most important part of her day. She'd have to fit it in later, she'd thought. When the pets were all ready and photographed, they were let loose on the street to go trick or treat to their hearts' content. Lex yelled loudly, directing them from house to house while dragging her sack along behind her. "I have lasers!" she exclaimed, striking a pose outside a house a few doors down whilst Colfer dramatically made a show of rolling his eyes. Lasers... Garo's eyes shot open. "Hey guys, um.. there's a little hole in my bag. I'll meet up with you later, alright?" The other pets nodded and Garo ran up the road, clutching her bag tightly. "I can't believe I almost forgot!" she murmured, continuing her run. She made her way to the beaten-down building and slipped in the back door, chewing her lip. "Evening, sir," Garo said, the yellow Scorchio turning around to greet her with a grin. She knew the drill and took the sheet off, moving to the chair in front of the ray and sitting down, letting herself be strapped in. The Scorchio kept smiling, a manic look in his eyes. "Garolou, my darling... I thought you'd miss tonight!" She returned the smile, shaking her head as he fastened the straps over her arms and legs. "I don't miss," Garo added, bracing herself as he aimed the lab ray toward her. It flashed red and she closed her eyes tight. "This went absolutely perfectly!" he gushed, holding the mirror up for her to admire her new wings. A Faerie Lutari... her second time being Faerie, her first was a Lupe. She grinned, fluttering into the air and enjoying the feeling of bliss as the breeze blew through her fur. Garo thanked the Scientist earnestly before zooming away. She had other plans. A little tiara was purchased and haphazardly balanced over her head as she flew to her own home. This couldn't work... could it? Her owner, Shannon, answered the door and grinned. "What a pretty princess!" the girl exclaimed, giving a handful of chocolates to her. Garo couldn't believe her luck, her own owner didn't even recognize her! And maybe if her owner didn't recognize her... would any of the other neighbours? A devilish smile curled onto her face. Time to make this the best Halloween ever. About a half hour later, Garo was on her way back to meet her siblings, struggling to lift the heavy bag of sweets. Pausing behind a nearby tree, she donned the bedsheet once again and folded her new wings in, padding along the leaf-covered ground toward the trio of pets, looking no different than she had when she'd left. "I'm back!" she said innocently, holding her candy bag. "What took you so long?" Lex shrieked. "You missed all the candy!" The Acara dramatically lifted a handful of candy from her bag, letting the pieces slip through her painted blue fingers to clatter back into the sack. Garo shrugged. "Couldn't find you guys," she lied, falling into line behind them as they finished up their tour of the neighbourhood. An hour or so and a lot more candy later, Garo inconspiculously hovered through the door of their Neohome, the white sheet draped over her not causing her owner to even bat an eye. The four pets proceeded to the living room where, on Colfer's count of three, they dumped their bags into the middle of the room. Piles of sweets- chocolates and gummies and hard candy, lay front of each pet. Wesson nearly drooled at the sight. But all three shut up quick when they saw the mountain in front of Garo. Twice as big as the rest of theirs... "How do you do it?" Lex crowed in complete awe of it. Colfer looked incredulous and Wesson was simply shocked, his jaw dropped to the floor. Garo simply smiled, her teeth showing through the hole in her sheet. "Must just be some Halloween magic," she said innocently. Colfer's eyes narrowed as the red Gelert shook his head rapidly. "No, no, no, this isn't physically possible!" he snapped, looking at Garo through his fake scientist glasses. "You can't just have twice the amount of candy as we did. You even missed time!" he waved his hand dismissively. 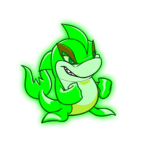 Garo shrugged, reaching down to scoop her candy away from the bulging eyes of Wesson and his drooling Petpet. Her turquoise paws closed around a little chocolate and Colfer raised an eyebrow. "Why are your hands blue?" he asked, his mind clearly spinning with the potential of what she could've done. Wesson and Lex looked on, curious. Garo froze. "Well... uh... I think I'm gonna hit the hay," she stuttered, grabbing the overflowing candy sack and practically running to her bedroom. She shut the door and dumped the candy onto the plush carpet, grinning down at it before removing her sheet and grinning at her reflection and her slightly off-kilter tiara. She'd reveal that she was Faerie tomorrow, perhaps, or she'd change colour altogether and have a little more fun. One thing was for sure, she decided- there wasn't much better than being a lab pet on Halloween.